Yellow-naped Amazon parrots are quick-witted creatures that make excellent pets for owners who want to form a great bond with their bird. Their intelligence and remarkable speech abilities have put them among the most popular Amazon parrot species. Yet, they're not the best bird for families with children because they're known to go through a period of slight aggression. Sometimes considered a subspecies of the yellow-crowned Amazon parrot, these birds are native to the Pacific side of Central America and northern South America. They are primarily found in southern Mexico and northwest Costa Rica. There are two well-known subspecies of the yellow-naped Amazon. The Honduras yellow-naped Amazon (Amazona ochrocephala parvipes) is found in Honduras, the Bay Islands, and parts of Nicaragua. The Roatán yellow-naped Amazon (Amazona ochrocephala caribae) is also native to northern Honduras as well as the island of Roatán. Like many exotic parrots that are kept as pets, this species is endangered in the wild. Much of this is due to deforestation as well as illegal trapping. This species is one of the smaller parrots and the adults only grow to about 12 to 15 inches from the beak to the tip of the tail. A healthy weight for this parrot is right around one pound. For such a small parrot, the yellow-naped Amazon can have a surprisingly long lifespan. While other parrots of this size may live up to 30 years, this species can live 50 to 60 years or longer with the proper care. Some reach the ages of 70 and even 90 years old. Yellow-naped Amazons are highly intelligent, comical birds that love to be the center of attention. They are very intelligent and tend to form extremely close bonds with their owners. These parrots may not screech as much as some, but they will get very loud on occasion. They are excellent talkers and singers, however. You can train these birds to develop a rather large vocabulary of words spoken with a great human-like clarity, but be careful what you say. They're also known for picking up (and relentlessly remembering) some phrases you'd prefer the bird to forget. Hand-fed Amazon parrots normally make loving, affectionate pets. Like many Amazons, however, yellow-naped Amazons go through a hormonal bluffing stage as they reach sexual maturity. While the phase does pass, it can sometimes last for up to two years. During their bluffing stage, yellow-naped Amazons are known to bite and show other aggressive behaviors. It's more apparent in the males and some birds act out more than others. Because of this, you may want to consider a female parrot and this may not be the best bird for families with children. Yellow-naped Amazons are mostly a bright green color. Their name comes from a blaze of yellow on the lower naped along the back of the neck. Another yellow patch often appears on the forehead and crown and they have slashes of red in the feathers of their wings. These birds have gray to black beaks and feet. There is a stunning color mutation of this bird. Its main body feathers appear as a blue-green with darker turquoise on the wings and a white spot on the nape. They're rare and command a high price in the bird world. Yellow-naped Amazon parrots are generally recommended for experienced bird owners. They require a great deal of attention and you will need to set aside a period each day for one-on-one interaction with your bird. This is the key to establishing and maintaining a healthy bond. These birds thrive on social interaction, and they need it to remain healthy and happy. Birds that are neglected can fall into destructive behavior patterns and depression. This can manifest itself in various physical and emotional problems, including feather plucking and biting people. For these reasons, you should ask about the history of any mature bird you're looking to adopt. Bad habits, past trauma, and poor taming can result in a parrot that even the best bird behaviorists will have difficulty rehabilitating. Potential owners should remember that if they adopt a yellow-naped Amazon, they are taking on the care of a creature that is every bit as intelligent and emotional as a human toddler. Due to their very long lifespan, caring for one is not a commitment to be taken lightly. You will also want to ensure to provide a cage that is suited to this bird. He may be small but he still needs room to move and play. To keep him occupied while you're not available, you'll want to outfit the cage with ladders, perches, and toys that he can entertain himself with. Like all Amazon parrots, yellow-naped Amazons are prone to obesity in captivity. This can not only take years off a bird's life but also lead to tumors and other serious health issues. It's important that you monitor the bird's diet and give him sufficient exercise. You can incorporate the two by providing opportunities to forage for some foods. Yellow-naped Amazons do best on a high-quality pelleted diet supplemented with seed mix. Daily servings of fresh bird-safe fruits and vegetables will also ensure that your bird is getting a good balance the vitamins and nutrients he needs. A yellow-naped Amazon needs several hours of daily outside-the-cage time to burn excess calories and stretch his muscles. This helps prevent weight gain and also provides the bird much-needed mental stimulation. Since these birds are smart and prone to boredom, you'll want to provide plenty of activities to keep your bird engaged. Teaching a yellow-naped Amazon tricks or giving him puzzle toys is a great way to keep his brain active. Other toys can be provided that play on the parrot's chewing instinct, letting him burn off some energy while in his cage. 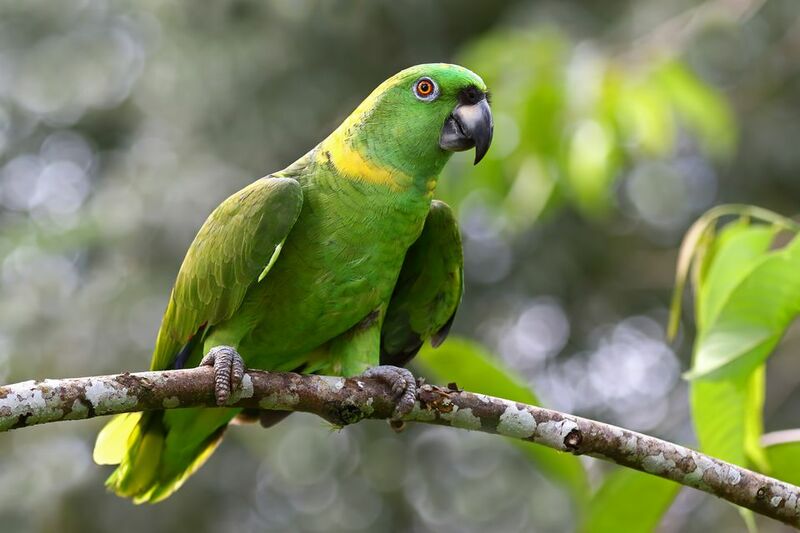 Otherwise, check out all of our other Amazon parrot species profiles.